Based in Adelaide, South Australia, the team at Ri-Industries have been committed to creating and supplying septic tanks , waste water treatment systems and concrete rainwater tanks that are renowned Australia wide. We have been in operation since 1947, and while our processes of creating concrete septic tanks and providing septic tank installation to our valued clients have kept pace with modern technology, our commitment to customer service and true product quality has never wavered. This dedication has resulted in constant and repeat business from all kinds of South Australian businesses, individuals and property owners. We are proud to manufacture septic tanks in Adelaide, waste water treatment systems and concrete rainwater tanks in Adelaide, to properties throughout SA and the Northern Territory. Whether we’re required to create septic tank systems for rural properties looking to be as self-sufficient as possible, or to incorporate replacement septic tank installation, the team at Ri-Industries are completely committed to providing a service of the highest possible quality. 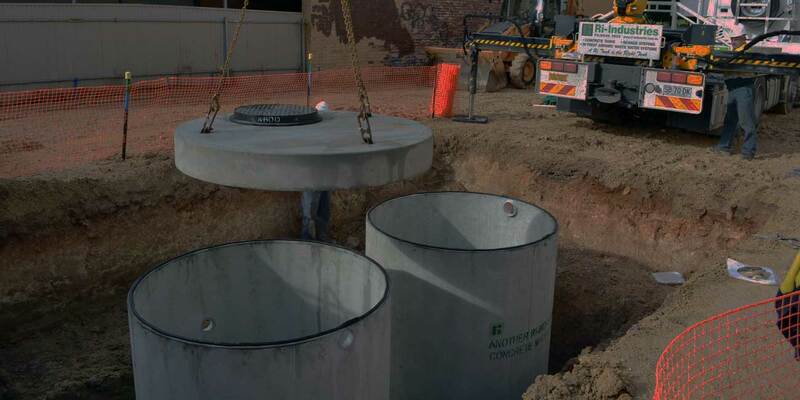 Our team are also well-versed in the creation and supply of concrete rainwater tanks and Ri-Treat systems, which we have provided to a huge variety of residential and commercial construction projects throughout South Australia and the Northern Territory. As with our septic tank designs, these products are suitable for many residential and commercial properties, and we are happy to discuss their usage and application with you. Ri-Industries is the South Australian distributor for FujiClean waste water treatment systems. Made from fibreglass, this is an excellent lightweight alternative to our Ri-Treat waste water treatment system – perfect where access is difficult or limited. Click here for more details about our FujiClean system. Ri-Industries has developed two designs in conjunction with Hydroscape: the Ri-Scape 3,300 and Ri-Scape 4,000. The new tanks (differing only in size) use unique technology to offer a great alternative when building in a smaller area. Click here for specifications. How does an aerobic waste water treatment system work?